Total miles: 1,500 Total hours: 26 hours on road! 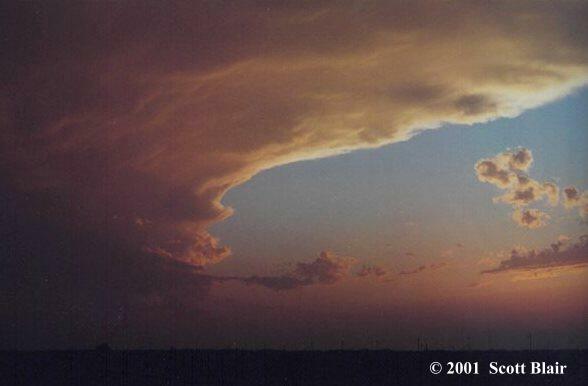 The highlight was probably the severe storm north of Plainview, TX just at sunset. It had a beautiful bow shape with lots of lightning. I shot 10 or so stills. 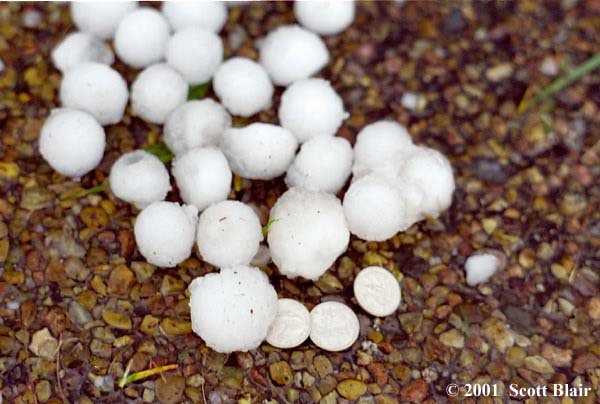 We had another severe storm in Plainview that brought us pea to dime size hail. We encountered hail that size on several other times. Lightning was everywhere on the drive home with plenty of 40-50mph sustained winds with downpours of rain. As we passed through Dallas, we saw numerous transformers explode and watched the sparks and green flashes light up the area. The timing of the system was the key. IF the dryline would have moved faster earlier in the day, this would have been a whole different story. 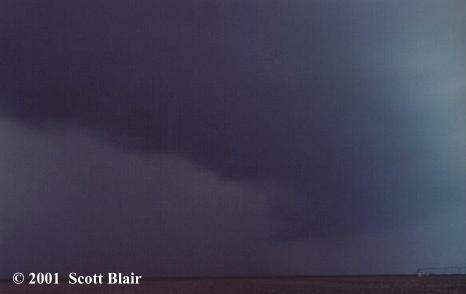 Jason Politte and I targeted areas of Eastern OK and viewed a well-formed bowing shelf cloud near Hanna. We continued NE on Hwy69, but were finally overtaken by the cell shortly after. Moving east on I-40, we had a very nice view of the severe cell at 11:30am. 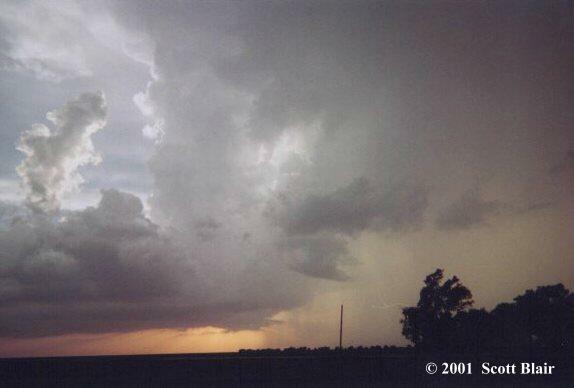 A well-defined precip core was tucked behind a bowing shelf cloud. Slight cyclonic rotation could be observed in a tight area ahead of the core with wrapping rain curtains persisting in the area. The storm was flying to the northeast, so we abandoned the cell and stopped briefly for data in Webber Falls. After viewing several lines of severe storms across Western Arkansas, we could not ignore the potential of Central AR. Observed a tornado warned cell near Augusta with a nice large funnel, but never could fully organize to the ground. All in all a difficult chase. For several days before April 6, several models suggested at the overall pattern of a significant outbreak across the Central Plains as extreme dynamics were expected to come together. Departing Monroe, LA on the 5th, Jason Politte and I targeted areas of Western Kansas. After passing through Oklahoma City, we downloaded the new SPC Day 1 Outlook. To no surprise, a high risk was issued for a portion of Western Kansas. We stayed up forecasting until nearly 3am. By 7am, we were forecasting again, enjoying the strong surface winds, and noticing the thick cloud cover ahead. This was an immediate concern. However, we departed Wichita and pulled off about 40 miles east of Ulysses, KS. Clouds still held, with very slow warming surface temps. The days expectations were rapidly falling. However, we did head west and managed to find blue sky with developing towers. However, with extreme dynamics and low instability, the chances of supercells dwindled down to nothing. A fast moving, crappy squall line developed, sending embedded cells racing NE in excess of 70mph. Needless to say, this was very frustrating and Jason and I ended the chase day within 45 minutes. We ate a tired dinner at the Pizza Hut in Liberal, KS before crashing for the night at the Oil Inn in Woodward, OK. The drive back was spent shooting pictures of a sunrise, cows, and windmills. FULL ACCOUNT AVAILABLE. Departed LIT very early along with Jason Politte. We later met up with Jeff Lawson in SW OK. Observed a nice supercell that produced a nice wall cloud and brief funnel. Just when things looked good, the cell crossed the boundary and weakened. We dropped south into Texas and observed a awesome left-split supercell in Knox County, TX. As we neared the storm, we were able to observe the fantastic structure. 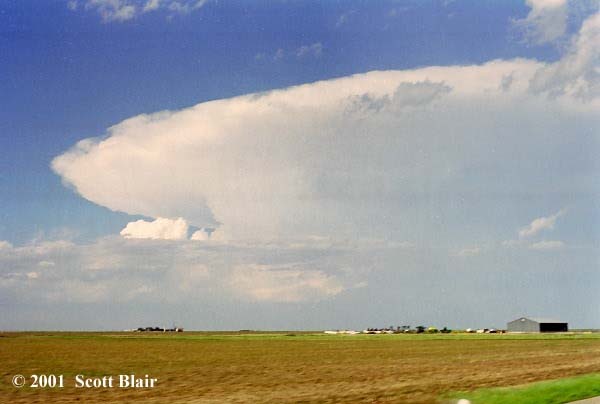 A large anvil overspread the area with a nice inflow tail moving towards the storm. Daylight was quickly ending, so we decided to get as close as possible to stop and shoot the storm. This was an excellent decision as we pulled off outside of Mabelle, TX. The storm became a large convective fireball, producing some dramatic sights. A good number of mammatus on the anvil also turned colors. This made for a perfect opportunity of photo stills. The cells were clearly dying as the sun fell behind the horizon. After several photos, we drove back to Wichita Falls for a dinner at Pizza Hut. We finally arrived back into Little Rock at 6:30am. This was more of a lightning chase than anything else. Observed an awesome lightning show around midnight May 8th. This turned out to be a remarkable event thanks to one very successful still of a close bolt. The detail obtained in the actual bolt is one of the best I've seen. All the stills were shot 11 floors high ontop of Olin Hall. Ironiclly, this was the last day the building was open before being condemed. 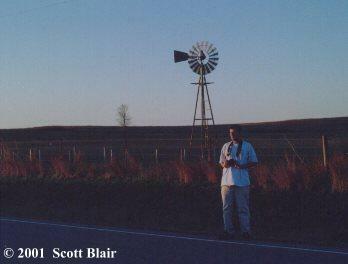 This day also marked the beginning of my 2001 chase vacation. Even with a somewhat minimal chase day expected, I decided to chase. After a good amount of forecasting, I sold myself with areas of Eastern Nebraska over Iowa. I departed LIT around 3am. My target area was Beatrice, NE. After driving seemingly all day, I finally reached the Nebraska border by early afternoon. I stopped at the local library in Beatrice for data. The situation over Iowa looked very nice, but out of my reach. Severe storms, including a few supercells, were possible, but the strong cap in place certainly made for a nerve racking few hours. I left Beatrice and setup south of Plattsmouth, NE. While waiting for initiation (now late afternoon) I was unexpectedly interviewed by a local news channel in Omaha. Shortly after, a watch was issued by SPC. Several towers looked interesting, so I moved south to Nebraska City and then east back onto I-29 in Iowa for better position. This was a good move as I targeted a severe storm west of Rock Port, MO. I got within a half mile of the base, east of Auburn, NE. 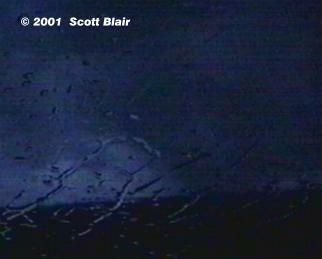 Rapid vertical motion with scud was feeding into the updraft. The meso started to tighten and showed decent rotation. The supercell really showed potential until rain wrapped around the updraft within one minutes time! I moved back east onto I-29. From there, I watched the day rapidly evolve into a linear event. After a few photos, I made the very long trip back to LIT, arriving back around 6am the next morning. FULL ACCOUNT AVAILABLE. After observing a nice LP near Cordell, OK, Eric Nguyen and I decided to stay in AMA to get into position for the next day that looked to be centered around upslope flow. About 40 miles east of AMA, we became intrigued with the frequent distant lightning flashes off to the northwest. With the average movement, the distant storm would come close to crossing our path on the way to AMA. As we passed Groom, the beginning of outflow winds increased. The supercell was much closer and a good amount of dust was being blown across the road. We quickly stopped for a gas stop and jumped back onto I-40. 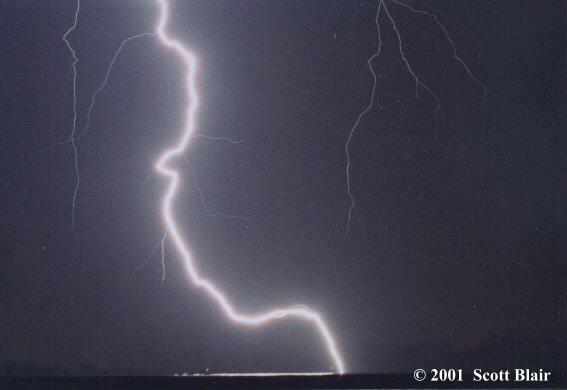 The lightning was a true strobe light as the frequency was amazing. Encountered a 73dBZ supercell with very impressive hail. Read account for more details, but a decent amount of damage was the result. FULL ACCOUNT AVAILABLE. 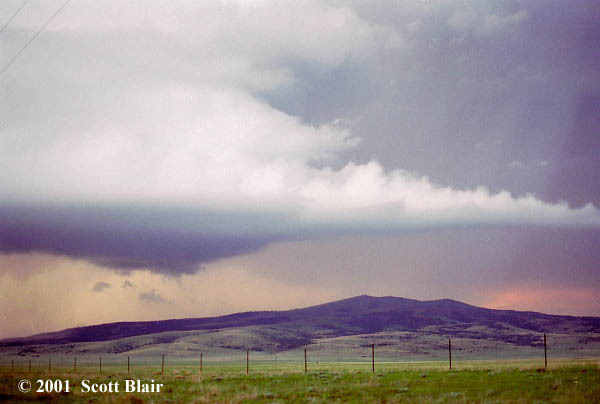 Eric Nguyen and I observed a beautiful long-lived supercell across the open land of NE New Mexico. 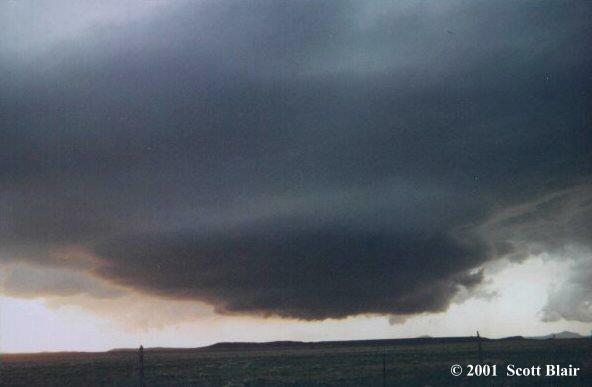 Going through no-mans-land roads, we had a perfect view of the LP supercell as it morphed through stages. 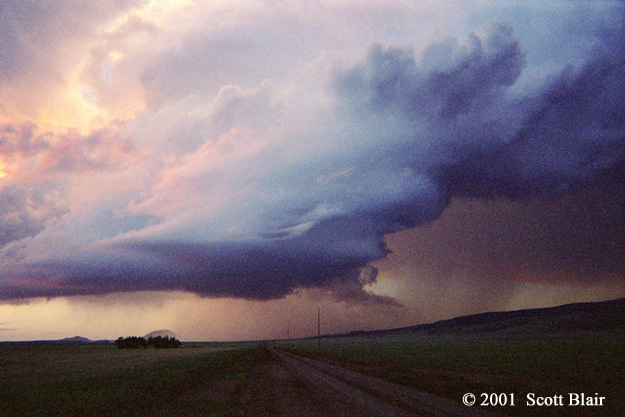 Towards sunset, the storm turned a classic LP supercell with breathtaking color. 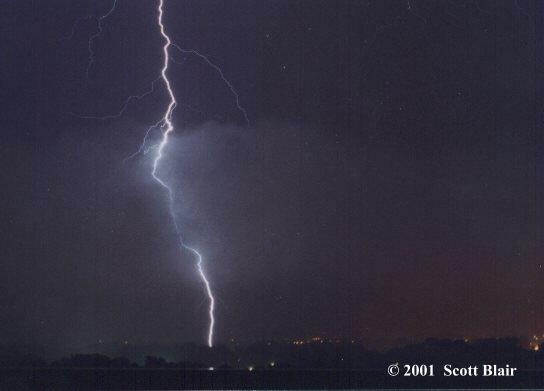 CG lightning fired across the peaks of mountains in the surrounding area. 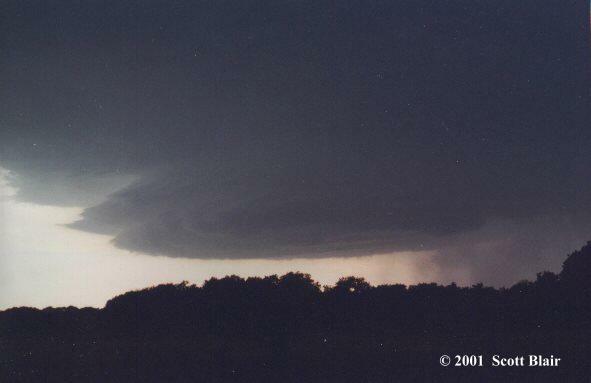 Darkness slowly set in, which resulted in the slow death of the supercell. After Eric attempted a few stills of the lightning, we continued on the rough Hwy456. Heading north, we encountered dime size hail still covering the ground. We made a very long drive back into AMA and crashed at a local hotel for the night. Certainly an excellent chase day as some wonderful storm structure and scenery shots were plentiful. Met up briefly with Jason Persoff, Bill Hark, Oliver Staiger, and Jason Politte as we targeted areas of Eastern Oklahoma on my birthday, May 20. While Jason, Bill, and Oliver became separated, Jason Politte and I continued east on Hwy9. We encountered some large hail near golf ball size. 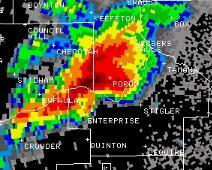 By 6:30pm, we approached Enterprise, OK (10 W Stigler), the rain abruptly ended and very strong RFD winds kicked in. Within 0.2 miles away, rapid rotation was present to the east. 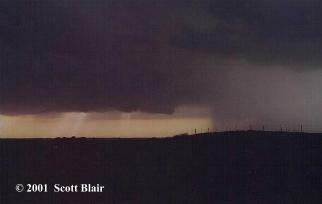 A large lowering was rapidly rotating as a small vortex condensed on the ground and ripped a few trees. Debris remained in the air for about 20 seconds before the tornado apparently lifted. Tough chase but in the end was an excellent success. The setup led us to deep South Central Texas as a few supercells developed. Limited road options made for a difficult chase, but finally observed a beautiful meso near Rock Springs, TX. After observing the cell, sunset arrived and Eric and I shot a few stills. 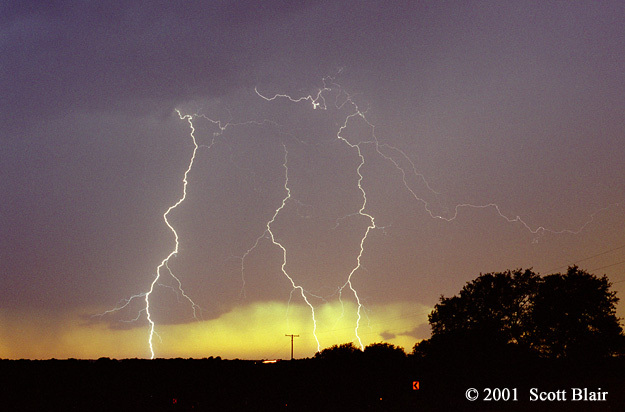 The color came out super as several white bolts were contrasted with a purple and yellow sky. Overall a good chase day. The overall setup held potential, but storms initiated much earlier than expected and quickly evolved into a squall line. Jason Politte and I observed a nice shelf near Garden City, KS and later observed 90mph winds with corn stalk debris flying past the cars. We attempted to pull ahead of the fast moving line, but were abruptly halted by a flat tire. This ended the chase and we finished the day in Garden City, which worked out to our advantage for the following day. FULL ACCOUNT AVAILABLE. Jason Politte and I targeted areas of SE CO on May 28. It was without a doubt a classic chase. We observed four beautiful supercells with fantastic structure train over the same general location during a time duration of five hours. At the same token, we observed the evolution and decay of a mesocyclone and tornado at very close range without changing locations. Everything worked out thanks to Mother Nature, forecasting, and strategies. It was a beautiful chase filled with so many experiences. Indeed a classic! Read full account for more photos. This chase might go down as the worst bust in my chasing career. Targeted Lamar, CO and left the target within one hour before a landspout fest. Jumped on a decent structured cell near Masterson before the cell abruptly died due to the supercell to the south. 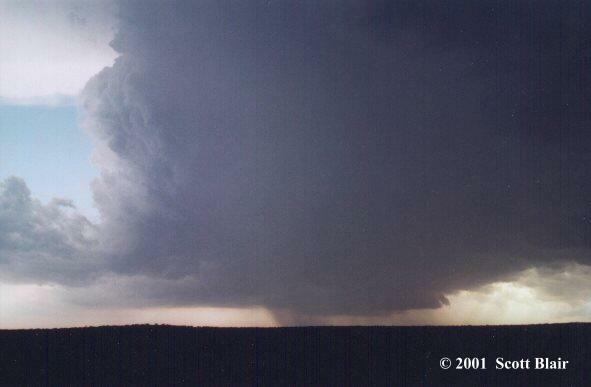 The cell to the south was the infamous White Deer supercell, which we blasted towards. The tornado lifted literally right before we got into view of the wall cloud. The day ended with my check engine light flashing. Needless to say, a difficult day! FULL ACCOUNT AVAILABLE. At 2pm we arrived in Logan, NM and took a bumpy Hwy39 northwest toward the storm. 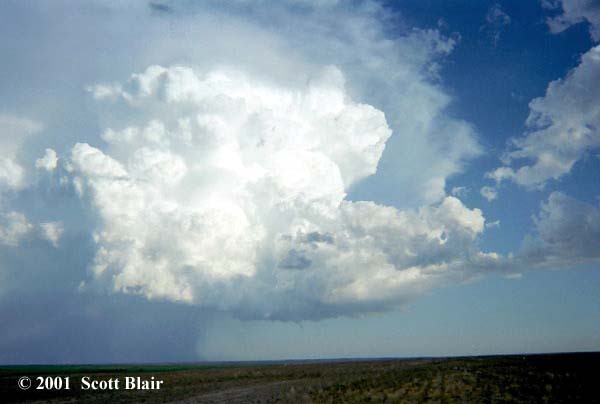 At 2:20pm, the cell was rapidly strengthening in between Abbot and Mills, NM. The dbz base reflectivity jumped from 64 to 72 in just a few scans. Shortly after, a tornado warning was issued for Harding County. The storm was well on its way to becoming a long lived, raging supercell. An absolutely beautiful barber pole, striated updraft was visible about four miles to our north. We crossed into Texas around 6:25pm. The storm was close, but still it appeared we had plenty of room to clear any significant precipitation on I-40. Unfortunately, a rapidly wrapping mesocyclone process began to occur, sending very large hail smashing into us. Jason Politte and I targeted areas along the lee-side trof from E Colorado to W Kansas. One distinct supercell developed well west of Garden City, KS and we blasted out of CO towards the cell. We observed two supercells near Ensign, the first being the original decaying storm and the second, a new LP supercell, which provided nice strucutre. Jason's car found difficulties in the mud, so we ended the day near Ensign. Overall a good chase day. After being burned on the upslope flow the previous two days, we decided to target an area across C/S Kansas. We departed Limon, CO early and continued with an uneventful long drive on I-70 to Salina, KS. At Salina, we received some brief information over NWR. By visual observations and surface obs, it was obvious we were close to the warm front. While this was tempting, we were interested in a dryline punch the models were indicating further south. At Newton, we reviewed data for over an hour, it appeared our current location was decent. 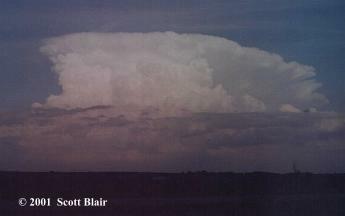 A rapidly exploding tower was developing about 70 miles SSW of our location. We quickly dropped south on Hwy49, then back west on Hwy44. As we approached east of Anthony, KS, hail scattered the road. It was obvious this storm was in no threat of producing anything significant. 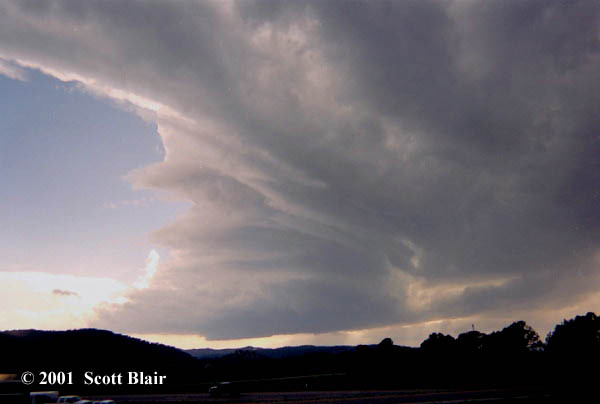 The supercell was LP in nature and after about 20 minutes, clear signs of rapid weakening took place. Eventually the storm died a LP death, rapidly shrinking up into a tiny updraft. 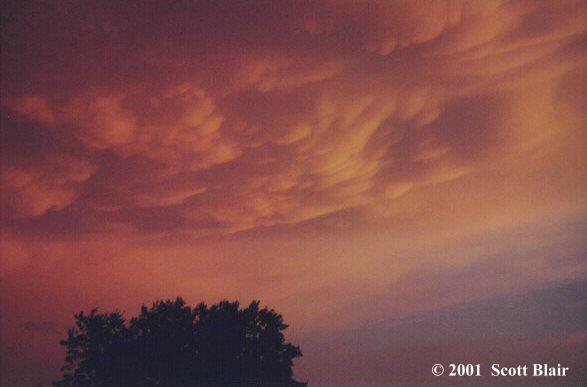 The storm created an orphan anvil, which produced a beautiful mammatus sunset. 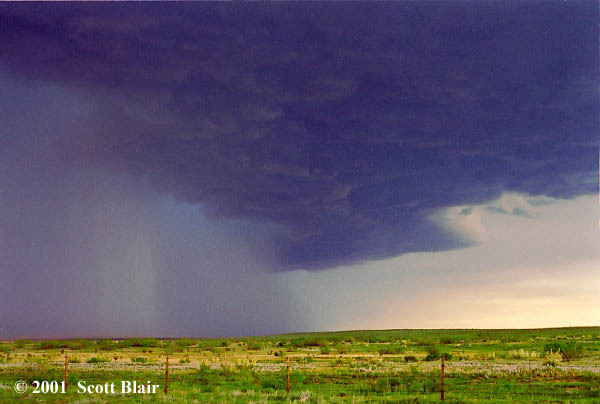 Derek Deroche and I targeted areas of West Central Texas and observed two marginal supercells and small hail. The highlight of the day was a spectacular anvil crawler lightning show on the back side of the storms. 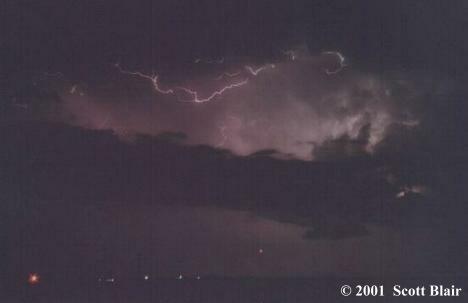 We attempted to catch the tornadic supercell at night near Denton, TX but failed to observe anything significant. I ended the day in Greenville. FULL ACCOUNT AVAILABLE. At 7pm, convection exploded across NW Arkansas. Jason Politte and I quickly moved east on I-40 as the cells were becoming supercellular. We entered the Arkansas border at 8pm. 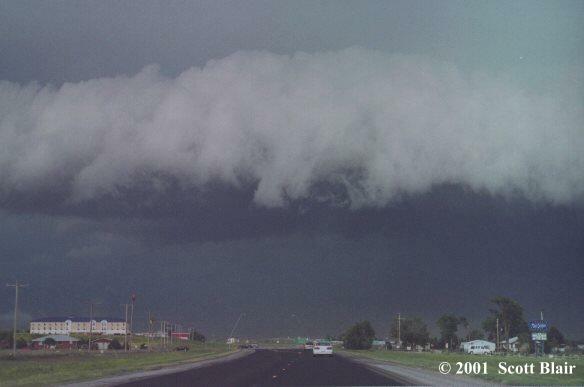 This was the same time frame that a monster supercell was crossing I-40 near Altus, AR. Unfortunately, this storm produced a strong F2 tornado that killed a woman in a mobile home. As this storm continued on its northeast track, more supercells developed in the same general area. Setting up SW Hunt, the wind consistently increased from the NW around 20-25mph. Precip greatly increased and quarter sized hail began to fall. At 9:10pm, the situation became quite intense. The winds abruptly shifted from the west with a sustained speed of 50-60mph. Wrapping rain curtains became visible crossing the freeway. What appeared as fine mist, perhaps condensation, was thrown into the mix. 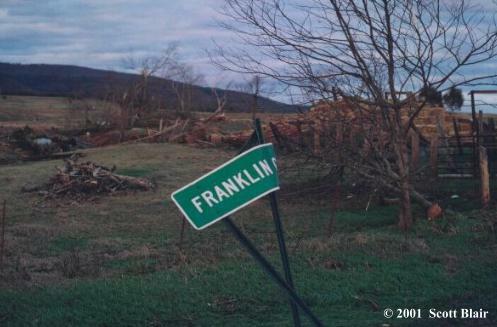 This was certainly inflow winds. 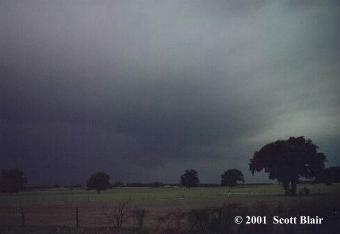 It is likely this was inflow into a weak tornado that crossed the road just to the east of our location. Within 30 seconds of this event, all precip ended and winds shifted to the SW.
FULL ACCOUNT AVAILABLE. Supercells quickly developed across Central and Northern Louisiana by mid afternoon. We located a landline for data at the Holiday Inn Express. The strong cap was weakening but still held over most of Arkansas. By 4pm, a couple supercells finally developed across South Arkansas. Considering nightfall was nearing and the cells were located in tree land, we decided to hold off a tad longer in PBF. At 6:50pm, a tornado warning was issued for SE Jefferson County. The warning and nowcast updates confirmed numerous damage reports out of Star City. We quickly stopped near Tamo, AR as the rain significantly lessened. As soon as we pulled over, lightning backlit a large wedge-shaped object to the SSE of our location. After a few more flashes, it was obvious a tornado was on the ground about 3-4 miles south of Tamo or in the path of Grady, AR. The tornado remained on the ground for two minutes before lifting. The large and very low hanging meso continued towards Grady but never visually touched back down. Return to other significant chase accounts.